All hearing aids contain the same components: receiver (microphone), amplifier, speaker, battery, and program/volume control. Hearing aid styles differ in the organization of these parts and how they are worn. 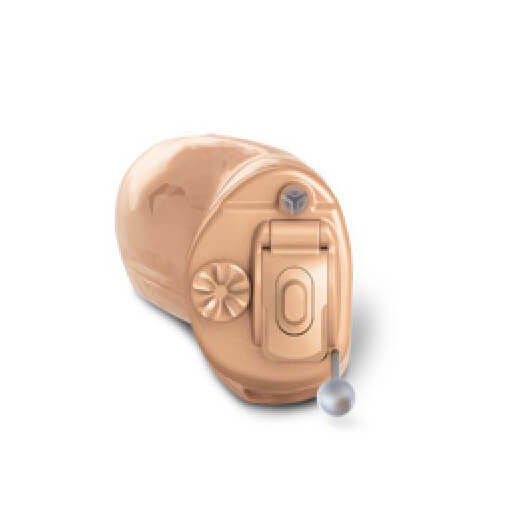 BTE hearing aids consist of a plastic component that houses the electronic parts of the aid which rests on the back of your ear and a plastic tube and plastic mold that delivers amplified sound in your ear canal. 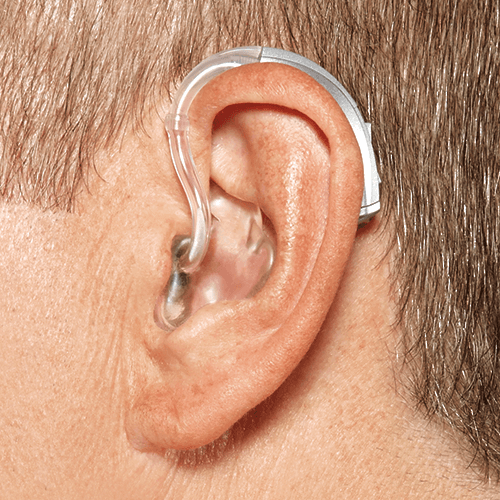 This type of hearing aid can accommodate the most severe to profound hearing losses. The receiver in the ear (RITE) is also known as the receiver in canal (RIC) hearing aid. It is similar to the BTE hearing aid in that the device sits behinds the ear. Unlike the BTE, the receiver (speaker) fits into the ear and is connected to the device behind the ear with a thin wire. The plastic housing on the RITE is often smaller than the BTE and the thin wire is more discrete than the more thicker plastic tubing and mold on the BTE. RITEs are currently the most widely dispensed devices on the market. ITE hearing aids may be worn as a half shell or full shell and ITC are slightly smaller fitting more in the canal portion of the ear rather the concha (outer portion of the ear). Both are made from a customized mold of your ears, with the faceplate resting on the surface of your concha or on the outside of the canal. People with mild to severe hearing loss benefit from ITE and ITC hearing aid models. They are also convenient for people who wear glasses, as they do not occupy space above your ear. For people who want discretion and have milder forms of hearing loss, CIC and and IIC hearing aids are great. Both styles are worn deep in the ear canal with the CIC only barely visible and the IIC completely invisible. Custom molds are made of your ear canal, and your hearing professional will show you how to insert your CIC or IIC hearing aids. Hearing aids are designed with features to accommodate the many different aspects of hearing loss. You will find a number of common features in hearing aids, outlined below. Through wireless connection, hearing aid wearers may stream phone calls from their smartphones, music, and other media directly to their hearing aids without the assistance of other devices. Directional microphones help to focus on sounds wearers prefer to hear, and especially help with conversation in background noise. Telecoils connect hearing aid wearers to the PA systems in these spaces and allow them to stream the sounds directly to their hearing aids through electromagnetic connection. This is a form of assistive listening. Digital processing platforms have made hearing aids into minicomputers! They balance and analyze sound from the wearer’s environment, providing wearers with clear sound signals and better speech recognition. Hearing aids are designed with some level of resistance against moisture and debris. Check the hearing aids IP rating – the higher it is, the better it resists the elements. Speech recognition features help people with hearing loss identify patterns, balance different frequencies of voices, and focus on specific speakers in challenging noise environments. Many newer hearing aids have begun to offer features tailored to music listening, to help with live music, recorded music, and also for musicians who perform. Feedback happens when sounds are amplified and are picked up again by the hearing aid’s microphone. Most hearing aids offer feedback cancellation, which anticipates and cancels out feedback noise before it occurs, providing a comfortable listening experience. Oticon is a Danish manufacturer, known for their BrainHearing Technology. BrainHearing offers features to assist the brain in the auditory process, which may be compromised with hearing loss. The OPN is Oticon’s latest hearing aid, providing wearers with an “open sound” solution. Based in Canada, Unitron offers a series of advanced hearing instruments as well as the innovative TrueFit Software. With the understanding that hearing is a personalized experience, Unitron offers heightened customization for hearing aid wearers, as well as a test period to find the best fit. Phonak is a Swiss manufacturer of hearing aids, known for their long-term wear hearing aid Lyric. Lyric may be worn 24/7 for months at a time, without removal. 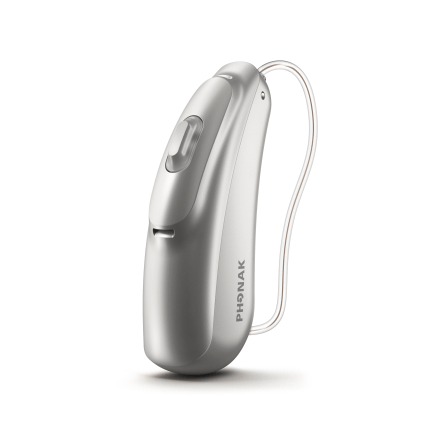 Phonak also offers a series of hearing aids at incremental technology levels to meet specific hearing needs. Starkey Hearing Technologies is an American hearing aid manufacturer, best known for the Halo 2 Made for iPhone hearing aid. As one of the world’s first smartphone compatible hearing aids, Halo 2 has opened up accessibility for wearers. The Muse Made for Life is Starkey’s newest offering, with enhanced features. 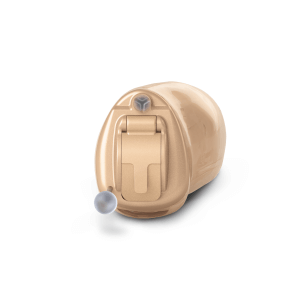 Signia offers state-of-the-art hearing aids, building upon the innovations of their sister brand, Siemens. Signia’s newest hearing aids provide you with access to sounds the way nature intended, with Own Voice Processing.